I have a tendency to get a little obsessed with a new food hobby. I get obsessed for a while then something distracts me and I meander off to a new obsession but eventually something returns my attention to the original obsession. That's why it's not THAT bad if an obsession with a new food hobby costs me a little money. Days into my canning obsession I passed a bookstore and couldn't resist picking up Food in Jars Preserving in Small Batches Year-Round by Marisa McClellan. I figured it would be a good buy as I had already come across her blog www.foodinjars.com and got some good information there. I also really like that the book was for small batch canning as that is what I had the equipment and desire to do. Overall this book is beautiful. The pictures are gorgeous and the layout is very visually appealing. I've been canning a lot lately and so far have made three recipes from this book. 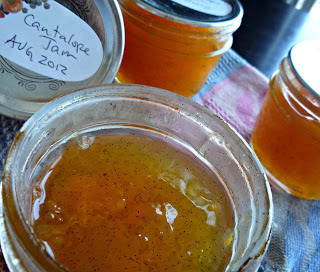 I started with Cantaloupe Jam. I hate cantaloupe but the McClellan said that this recipe tasted like Creamsicle. I couldn't resist! It does taste like creamsicle but because of that it is a little odd on bread. However, I think it will be really good in shortbread or in some type of jam cookie. I had a glut of apples due to some Not Far From The Tree apple picks so I made Honey Lemon Apple Jam and Apple-Cranberry Jam. All of the Honey Lemon jars sealed (YAY! First time!) so I won't be able to taste that jam for a while. The author states that the apple-cranberry jam is good on turkey (as in a cranberry sauce) or on bread and I could definitely see how it would be good on tofu or seitan. It may actually be too savory to make a good toast jam. The instructions in this book are easy to follow and clear. The amount of jam seems to vary slightly from what is stated but that is due, I think, to the ripeness of the fruit and will be an issue in any canning recipe. I like the flavor combinations and find them intriguing. I will definitely be canning more from this book in the future and would recommend it.